Now that the 2011 season is over I would like to thank all of the Boston Northeast clubs for making the championships here the best in North America. It truly is great to go out to Canton and enjoy the high standard of football and hurling week in and week out - it certainly makes the job easier if not a pleasure. Thanks to all of you who tuned in to the blog keep up with the GAA events here in Boston. A big thank you to the Boston Northeast Board, Paddy Barry's, and Siansa 8 for their support this season. Also, I will be putting unpublished photos from the season on the Facebook page over the coming months - so keep an eye on that. The auld camera is showing its age these days and needs an upgrade, but feel free to copy or downloand any that you wish to. Looking forward to the break and then on to 2012! Aidan McAnespies Junior Bs defeated by Pittsburgh in Semi-Final. Macs had a five point win over local side, Sons of Boru in the quarter final on Friday and headed into Saturday’s game with every expectation of making the final but it was not to be. The Boston representatives lost out by a score of 2-4 to 1-9. McAnespies played well in the first half. Willie Carroll and Jimmy Corrigan did well in the forward line as did old reliable, Peadar Nugent. At the end of the first half McAnespies led by a score of 1-3 to 0-4. Willie Carroll opened the scoring after 10 minutes with a pointed free. After Niall Mullen leveled for Pittsburgh, Peadar Nugent put the Macs into a four point lead with a point that was followed by a goal from close range. McAnespies played the ball well and held the Pittsburgh forwards to the single point for most of the first half, and things looked promising for the Boston side. The writing was on the wall as the game wore on however and fitness became a factor. Nate Mavrer in the middle of the field proved to be problematic for McAnespies. At the tallest man on the field, Mavrer won plenty of ball for the youngsters and gradually the possession battle swung to Pittsburgh. Late in the half the Celtics landed three points to close the gap to two points at the break. Action from McAnespies v Celtics in Semi-Final. Pittsburgh opened the second half with three quick points, and as McAnespies tired the Pennsylvania side took over. With plenty of running and a short passing game the Celtics opened up McAnespies back line with increasing frequency and points came from Niall Mullen, Ryan Dowd, and Niall Hawking. McAnespies looked to get the ball into corner forwards Benny McGettigan and Peadar Nugent at every opportunity, and McGettigan goaled to put Macs back on top for a brief period. As the game reached the later stages options coming out of defence were limited as tired legs got the better of the McAnespies players. When Pittsburgh goaled to take a one point lead with 10 minutes to go they looked to be in control. Another point followed and with time running out McAnespies needed a goal to pull off an unlikely victory. In injury time the Boston side almost did just that. The ball bobbled around the penalty area but a McAnespies boot could not connect for a decent shot and with that the final whistle sounded. Disappointing for McAnespies, though in truth a win would have amounted to stealing the game. In the final Pittsburgh secured an easy win over their mid-west rivals Detroit, which makes you wonder what might have been. Macs: E. McKenna, O. Guirke, P. McCusker, C. Traynor, G. Hennessey, M. Bogue, P. Nugent, E. McCusker, S. McGettigan, W. Carroll, J. Corrigan, R. McCrystal, E. Daly, P. Ryan, P. Nolan. Pitsburgh: C. Heaney, D. Kelly, F. Finnan, D. Coyne, R. McAleenan, D. Ruben, N. Mavrer, K. Hathaway, R. Macel, R. Dowd, D. Kennedy, N. Hawking, N. Mullen. 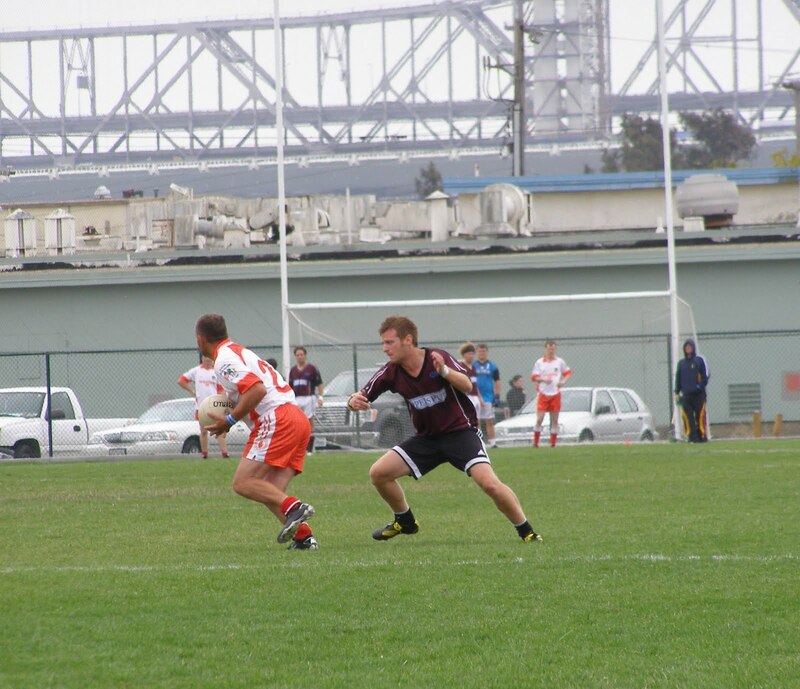 Na Fianna San Fran defeat Galway in Senior Hurling Final. Galway arrived in San Francisco with a team that was severely depleted from the one that lifted the Boston championship the week before. The Galway boys made the most of it and defeated Vancouver in the semi-final on Saturday by a score of 0-17 to 0-13. Conditions on Treasure Island were difficult given the stiff cross-field breeze. Galway led at the break by four points, 0-9 to 0-5, though it seemed the breeze favoured them in the first half. Vancouver worked their way back into the game and got within one point late in the game, but Galway stuck to the task and three points late in the game saved their bacon. It looked as if Vancouver had the momentum, but Keith Killilea put a point over on 24 minutes, and Paul Guinan pointed two late frees to give Galway the four point cushion. Vancouver had chances to win the game but on one or two occasions when it seemed as if a goal was on, could not produce the goods. Galway went on to face Na Fianna who looked very good in their semi-final defeat of their local San Francisco rivals Naomh Padraig. The Galway Hurlers made the final but did not have enough for Na Fianna. Galway were up against it in the final. Na Fianna were fit and sharp and Galway did not get much change from the opposing back line. By the time the first half was 20 minutes old Galway were behind by eight points and it did not get much better. Kieran Grehan pointed five times, four from frees, while wing forward Shane Maher netted two goals, the second coming with five minutes left in the half. For their part Galway got a sterling performance from Killian Murphy at corner back and Sylvie Lennane in the half back line. Galway pointed twice from Paul Guinan frees and really should have had more to show for their efforts on the scoreboard. There were several missed scoring chances that would have put some respectability on the scoreboard. At the break Na Fianna led by a score of 2-8 to 0-2. The trophy looked destined for San Francisco. And so it was. Galway lifted their effort somewhat in the second half, but were still not a match for the local outfit. Shortly after the restart Maher had his hat trick and further points came from Grehan and Jody Brennan. Galway managed scores from Fintan O’Leary, Killilea and Guinan. It became a matter of waiting for the final whistle as the outcome was in no doubt. Paul Guinan netted from a 21 yard free to make things look respectable but Galway just did not have the horses, while for Na Fianna it must have seemed too easy. It must be noted that Turloughmore native and Galway HC veteran, Josie Fahy, togged and made an appearance in the final minutes of the game. The last time the finals were held in the Bay Area a decade ago Galway also faced Na Fianna in the senior hurling final. Back then it was Galway who had the facile win with a team that contained names such as Budddy Curley, David Franks, Jeffrey Lynskey, and Martin Cullinane. It seems however as if the Galway Hurling Club is back on the rise after 10 years in the doldrums. Galway: D. Kilmartin, A. Murphy, K. Murphy, D. McMahon, S. Lennane, L. Byrne, D. Murray, G. McNamara, P. Guinan, F. O’Leary, J. Byrne, K. Killilea, J. Kinsella, S. Corbett, J. Fahy. Na Fianna: M. Bagery, L. Gormley, A. Cuddihy, J. Walsh, G. Wheelock, A. Cunnane, J. Hayes, S. Burrows, J. Molloy, S. Maher, K. Grehan, J. Brennan, M. Doyle. The Barley House Wolves of Concord NH made the final of the Junior C Competition with victories over Oregon and Indianapolis on Friday and Saturday respectively. On Friday the Wolves demolished Oregon, a new club to the hurling scene. Saturday’s semi-final against Indy proved a far sterner test. The Wolves went down early. After 10 minutes the side from the Granite State were down by 2-2 to no score, and looked like they were at risk of going down to a hiding. The Wolves bucked down and thanks to some hard work in defence, especially from Eddie Clements, Dennis Traynor, and Lore Forde gradually turned the tables. Points started to flow from Rory O’Mahoney, Dan Hanna, and Matt Pulomina at half time the sides were level. The Wolves kept up the pressure and in the second half the job was made easier as goals came from O’Mahoney, Derek Reiss, and Alec Foley. The Wolves headed into Sunday’s final with hopes high to add a North American Championship to their Northeast title. St. Louis Defend a 21-Yard BHW Free. The sternest test of the weekend for the Granite Staters proved to be the final. Despite leading for most of the game and having had plenty of chances to add to the lead, the Wolves lost out at the very end by the narrowest of margins having conceded a late goal. St. Louis, one of the biggest and well-established junior hurling clubs in North America displayed some fine shooting skills. Several scores from the mid-western outfit were worthy of the senior stage. The Wolves took control of the contest with about 10 minutes left in the first half and added to their lead in the early stages of the second. St. Louis however kept chipping away with the points and when the chance came to take a late lead they took it. The Wolves had a chance to steal a late winner but the opposition keeper pulled off the save of the game. The Wolves relied on a first half goal from Derek Reiss to keep in the game in the early going. St. Louis took a five points to one goal lead. Rory O’Mahoney added one in the points column for the northeastern side, and with 20 minutes gone netted a goal after the Corkman latched on to a poor clearance. At the half the Wolves led 2-2 to 0-6. Rory O'Mahoney in Action in the Semi-Final. Things looked very promising for the Wolves for most of the second half. The Concord men worked hard for the ball and in defence closed down the space. A goal came from Dan Hanna early on. St. Louis answered with three points, two lovely efforts from distance. Darragh Madden stemmed the tide with a point and at that stage the Wolves lead was three points. With the Wolves living dangerously St. Louis pointed again from distance and the lead was now a dangerous two points. With minutes left on the clock St. Louis won a free from 21 yards and planted the ball in the net to take the lead. Now it was the Wolves who had to press and they did. Chances were generated, but a score did not come. Disappointment with the final result, but having come within a hair of winning the championship on their first try, the Concord boys have much to be encouraged by for the future. BHW: D. Trainor, R. Brown, S. McCarty, M. Gregoire, E. Clements, L. Forde, M. Pulomena, D. Hanna, D. Madden, R. O’Mahoney, R. Valas, A. Foley, D. Reiss, S. Baron, R. Burnham. Tir na nOg suffered a tough loss in the Ladies Senior Football Final against a sharp Mariead Farrell’s side from Philadelphia. Tir na nOg had a long layoff since winning the Boston championship, while Farrell’s had a competitive semi-final on Saturday versus the local Fog City Harps team. The Boston side looked dead and buried with 5 minutes to go, but two late goals gave hope, however, there was not to be a winner for the Boston team and Farrell’s celebrated their second championship in a row. Tir na nOg almost pulled off an incredible comeback but fell just short in the end. Farrell’s got off to the better start. Adele Gallagher pointed a free to get things going. Natalia Hyland leveled for Tir na nOg as the Boston ladies looked to get into the game. With Tir na nOg on the attack and looking like they were beginning to put their stamp on the game, Farrell’s struck with a breakaway goal. Ciara Moore was the scorer after the Philadelphia side swept up the field. The Boston side continued to work their way into the game and put two well worked points over the bar. Mairead Luttrel and Natalia Hyland were prominent in the efforts Tir na nOg. The Philly side then hit with goal number two. This time it was a well worked score with the opening created by some slick handpassing. As Tir na nOg tried to put the setbacks behind them, and worked hard to keep the scoreboard ticking over, Philly displayed some very good football with the Fegan twins from County Down instrumental in many of their moves. At the break the team from Philly led by a score of 2-4 to 0-5. Things did not get any better for the Boston girls in the second half. Having opened with the first score Tir na nOg could not make a dent in the deficit. There was great work from the Boston team to try and turn the game around, but to no avail. The opposing girls were quicker to the ball and when Tir na nOg scored, Philly had an answer. After adding a point to their lead, Philly hit with goal number three. A high ball into the box was picked up by Sabrina Moore and the corner forward took her chance well. Points were added by Orla Fegan and Moore and entering the final 10 minutes Philly led by 11 points. Tir na nOg had some life left in them and were by no means out of ammo. The Boston side pushed hard and were rewarded with a goal from Jenny Murphy. Time still ticking away and Paula McGrath netted a second – five points in it and injury time. Incredibly Tir na nOg scored a third goal to reduce the gap to 2 points, could the impossible happen? It was not to be as Philly won possession and played out the clock to retain their NACB title. Disappointment for the Boston side, but credit must be taken for their never say die attitude. As for Mairead Farrell’s, the Philly side will be going for three-in-a-row on home soil next year. Tir na nOg: L. Brick, T. Moran, S. Patterson, L. Fennell, M. Luttrell, S. Delahunty, H. Noonan, N. McEvoy, P. McGrath, N. Hyland, C. Nee, S. Bannon, J. Murphy. Mairead Farrells: D. DeBaldo, A. Sheilds, L. McGullion, B. McManus, N. McGowan, D. Johns, A. Gallagher, S. Fegan, S. O’Hara, O. Fegan, N. Walsh, S. Moore, C. Moore. Action from the Junior A Final. Wexford’s journey to their first junior hurling title was not without its bumps. At first it seemed as if the journey to San Francisco was all for nothing after the team was disqualified for showing up late on Saturday morning for an 8:00am start, but the Slaneysiders were given a reprieve and a game Sunday morning against Toronto. Wexford took their second chance and came away with a comfortable win by a score of 3-20 to 1-10. The Wexford boys then had to gather themselves for a 12:00 final against local side, Na Fianna. Wexford survived both battles to emerge victorious with a few players limping through the final stages of the final. Steven Corcoran was invaluable at corner forward, his speed an accuracy caused problems for Na Fianna, while at the back Peter Nolan, Denis Brennan, Ronan Shaughnessy and James Brennan were solid. The first half of the final saw Wexford pull away into a lead that they retained for the rest of the game. Not that things were comfortable all the way through. Corcoran was the man to put the first few points over the bar, and a goal after 10 minutes settled Wexford. Na Fianna managed two points and when in attack looked dangerous if given the space. Wexford worked hard and showed composure when clearing from defence however. With the Boston side leading by 1-6 to 0-4 Na Fianna propelled themselves right back into the game with a goal from a ball down the middle and over the top. Andy Shore in goal got a stick to it but the ball ended up in the roof of the net. Wexford answered by finishing the half strongly and netted twice. The first came from Tony Murphy. Corcoran provided the assist, and a minute later put one away for himself. At the break Wexford looked to be in a commanding lead, 3-6 to 1-5. Wexford Celebrate the NACB Junior A Hurling Championship. The second half was not quite as comfortable for Wexford. Playing their second game in the space of three hours, there were a few players hobbling. Na Fianna enjoyed plenty of possession and on a few occasions threatened the Wexford goal. Wexford made good use of the outlets available in the forward line. Peter Ryan, Murphy, and Corcoran accounted for points to keep Wexford’s noses ahead. Mid-way through the half Na Fianna scrambled a goal to bring them within six points, but that was the last score of the game for them. Shore made one fine save and Wexford fell back to hassle and harry. With Wexford looking very tired Corcoran popped up for a beautiful score to give the Bostonside a boost. The game ended with Wexford points from Corcoran and Moloney to lift their first North American junior trophy. Wexford: R. Leydon, P. Nolan, D. Brennan, R. Shaughnessy, A. Shore, J. Brennan, S. White, T. Moloney, D. Reddin, C. McArdle, P. McArdle, T. Murphy, S. Corcoran. Aidan McAnespies brought a full squad of players to contest the senior football championship and were the talk of the finals. Sean Treacys provided the opposition for the semi-final and the reigning NACB champions went into the game with high hopes of retaining their title. McAnespies had to work hard to dispel those hopes, especially in the first half. Treacy’s went into an early three points to one lead, and the stiff breeze forced McAnespies into a short passing game to work the ball into scoring post. The Boston side eventually figured out the formula and started to put some scores over the bar. Plunkett Kane showed the way and accounted for three points, while Paul O’Donoghue, Gareth O’Neill, and Sean Cournane scored one each to put McAnespies into a 0-7 to 0-5 lead at the break. The second half proved easier as Treacy’s began to tire. In fact Treacy’s were limited to two points in the second half, while McAnespies netted three times; Kane, O’Donoghue, and O’Neill were the goal scorers. McAnespies had every reason to be confident going into Sunday’s final against Parnells Chicago. Plunkett Kane in action in Saturday's Semi-Final. Parnells made the Boston side work for the victory in the final. The Chicago team swarmed defence in an effort thwart the vaunted McAnespies forward line, and when in attack looked dangerous. It was a tight first half. McAnespies tried to get their running game going and Colm McCrory was instrumental in the effort. The Monaghan man tried to open up the Parnells defence with his trademark running and accounted for two points. Parnells took the game to McAnespies however, and caused a lot of problems for the back line. With 20 minutes gone it was four points each. Points from Eoin Keating and Paul Carey kept the Chicago side on level terms. Sean Cournane and Plunkett Kane also pointed for McAnespies, while corner forwards Paul O’Donoghue and Cournane had a tough time of it with the conditions and crowded Parnells defence. McAnespies also suffered a setback when Ryan McCloskey had to leave the action due to a leg injury and was replaced by Rory Bracken, who in turn experienced a recurrence of his shoulder injury and also had to be taken from the field. Kane and Sean Cournane pointed late in the first half to put McAnespies two points ahead at the break, 0-6 to 0-4. Niall Kerr lifts the NACB Trophy. McAnespies were forced to defend early in the second half as Parnells kept the pace up. The shooting from the Chicago side was wayward however and McAnespies were let off the hook with four wides. Philip Toner and Colm McCrory added a point each to the McAnespies lead, and McAnespies had the ball in the net at one stage, but the referee had blown for a penalty. O’Donoghue took it and John Rafter pulled off a fine save for Parnells to put the ball out for a 45. O’Donoghue made amends somewhat and put the ensuing kick over the bar to make it 0-4 to 0-9 with just over 15 minutes left. Things began to get a little dirty as challenges got heavy and Parnells grew a little desperate. Little added a point for McAnespies, but the Boston side almost conceded a goal but a high ball into the box came off the crossbar. The game was still very much up for the taking. Chicago made a push for a goal in the final 10 minutes and it was backs to the wall for McAnespies for a while. Parnells tagged two points, one from Cunningham and another from Carey. With 5 points in the game McAnespies started to live dangerously. Parnells needed a goal and went for it, hitting the post. With five minutes to go McAnespies led by six. Hughes made it seven as the clock ticked away. Parnells netted a late goal as full time approached to reduce the deficit to five points but back came McAnespies with a classic goal from Plunkett Kane to more or less put the issue to rest. The move began with Little and involved Toner before all Kane had to do was finish into the empty net. It was a hard earned third NACB senior football championship for McAnespies but a wholly deserved one. McAnespies went unbeaten for the season at senior level, winning all 10 Boston Championship games and both NACB games. Macs: C. Kendrick, N. Gallen, R. McCloskey, S. Hughes, N. Kerr, G. O’Neill, P. Kane, C. McCrory, P. Toner, P. O’Donoghue, M. Little, S. Cournane, B.Curran, R. Bracken, M. Bogue, W. Carroll,R. McCrystal. Parnells: J. Rafter, J. Hegarty, S. Gallen, D. Givney, E. Keating, S.Prendergast, W. Sherlocl, J. Cunningham, R. Werity, S. Donaghue, R. Doherty, P. Carey. It was a hectic weekend on Treasure Island in San Francisco over the Labor Day weekend. Treasure Island sits in the middle of San Francisco Bay and is accessible from the Bay Bridge which crosses from San Francisco to Oakland. The island is named after Robert Louis Stevenson, author of the book of the same name, who lived in San Francisco for a time. It is a man made island and was created for the San Francisco Exposition in the 1930s using material dredged from the harbor. It has also served as a Naval Yard and with several 1930s era buildings on the island, movies have been shot there. Land on the island is slated for development and the San Francisco GAA opened two fantastic playing fields and a clubhouse. 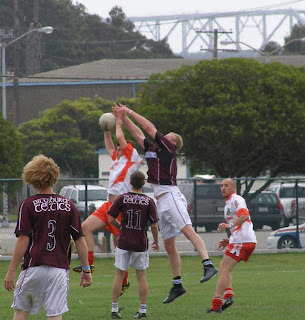 Pairc na nGael now serves as a home from which to promote and grow Gaelic Games games in the Bay Area. The site was abuzz for three days of Gaelic Games with teams from across the United States and Canada competing for North American Championships in different categories. Boston teams made 7 finals and took home 2 cups. Aidan McAnespies won their third senior football and Wexford won their first junior A hurling championship. Tir na nOg came within 2 points of the Ladies Senior Football championship, while at Junior C Hurling the Barley House Wolves looked good for the title but conceded a late goal to St. Louis to lose out. Senior Football: Aidan McAnespies won their third NACB senior championship by beating Parnells Chicago in the final 1-14 to 1-7. Senior Hurling: Galway made the final but lost heavily to Na Fianna San Fran by 3-14 to 1-6. Ladies Senior Football: Tir na nOg lost out to a very good Mairead Farrell's from Philly in the final, 3-7 to 3-9. Senior Camogie: Eire Og made the final but were beaten by St. Mary's Chicago in the final. Junior A Football: Wolfe Tones narrowly lost in the quarter final to Vancouver. Junior B Football: Aidan McAnespies made the the semi-final, but lost to eventual winners Pittsburgh Celtics 2-4 to 1-10. Junior A Hurling: Wexford beat Na Fianna San Fran to win their first NACB championship, 3-13 to 2-7. 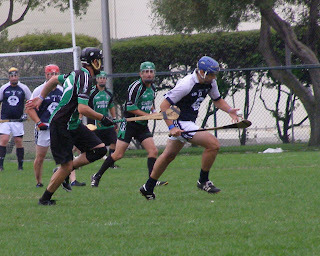 Junior C Hurling: Barley House Wolves of Concord, New Hampshire made it to the final game amidst a crowded field and lost narrowly to St. Louis by a score of 1-11 to 3-4. The Boston All American team also made the final, and ended up on the losing end of the final game. Senior Football: Aidan McAnespies beat Sean Treacy's San Fran 3-8 to 0-6 in today's semi-final and will play Parnells Chicago in the final tomorrow. Senior Hurling: Galway defeated Vancouver 0-17 to 0-13 and will play Na Fianna San Fran in tomorrow's final. Ladies Senior Football: Tir na nOg will contest the Ladies Senior Football final with a bye. Senior Camogie: Eire Og will play St. Mary's Chicago in tomorrow's final. Junior C Hurling: Barley House Wolves play in tomorrow's final. Sylvie Og Lennane under the ball for Galway. Junior A Hurling: Wexford get a second chance and will play their semifinal against Toronto at 8:00 tomorrow morning. Should they win the final will be played later in the day. All American Football: The Boston All American team are in tomorrow's final thanks to a win over Chicago, 6-14 to 1-2. Pre-game talk for the Wolves before their semi-final. Rory O'Mahoney for the Wolves v Indy in the semi-final. Ollie Guirke for Macs Junior B versus Pittsburgh. Plunkett Kane for Macs versus Sean Treacy's. Ladies Senior Final: Tir na nOg in final Sunday. Camogie: Eire Og play Chicago St Mary's in final Sunday. 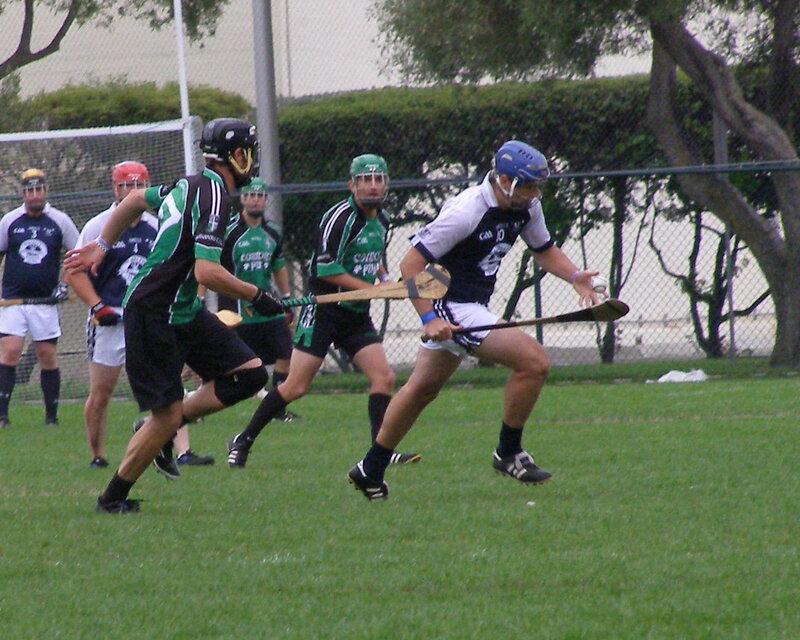 Junior C Hurling: Barley House Wolves from Concord,NH into Sunday's Final. Senior Hurling: Galway play Vancouver in semi-final at 3:30 today. Senior Football: McAnespies play SF Sean Treacy's at 5:00 in semi-final today. Junior A Football: Wolfe Tones beaten in Friday's Q/F by a point. Junior B Football: Aidan McAnespies made it to today's semi-final by beating Sons of Boru (SF) by 5 points Friday, but were beaten by Pittsburgh Celtics in today's semi-final 2-4 to 1-9. Click the link to listen to a run down of last weekend's finals in Boston.